The longest railway tunnel of the world is currently being built at the St. Gotthard massif. The two main tubes have a length of around 57 kilometers each. 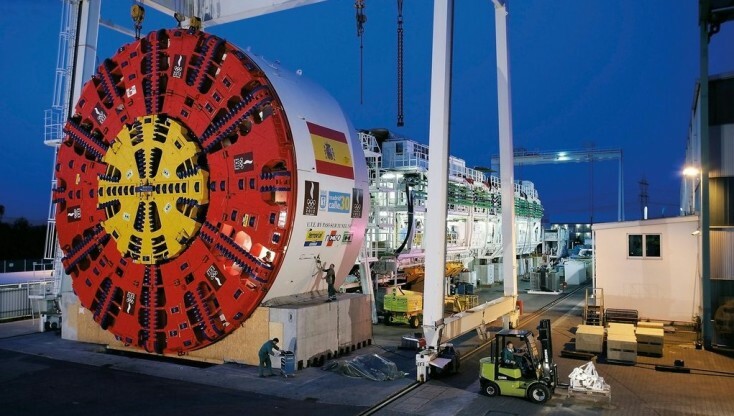 Four high-performance tunnel boring machines with a length of 440 meters each and a weight of almost 3,000 tons have drilled through the massif. The boring machines with a 3,500 kilowatt performance were driven by Bosch Rexroth technology. The transmission units developed by Bosch Rexroth, that were used at the St. Gotthard tunnel, are characterized by their efficiency and above all by their reliability. This is exactly what our customers in the tunnel construction industry expect – their schedules are tight and delays are costly. With many years of experience, Bosch Rexroth offers customized solutions. The focus is on reducing the Total Cost of Ownership for the customer. From standstill to high speed – the control modules of Bosch Rexroth enable users to optimally control a wide range of speeds. The combination of two-speed motors and the ability to use motors in tandem in free circulation sets new standards with regard to performance and power. With their compact design, the self-rotating cutter heads are able to drill even through the hardest rock layers. Thanks to our global network, the experts of Bosch Rexroth are always quickly on location. Our experience makes us a competent partner when it comes to equipping tunnel boring machines.